December is always a rush to the finish line. There’s always around 30 Christmas parties you need to attend, all your work demands have a cutoff time, and in between it all you’re needing to find and buy thoughtful gifts for family and friends. Then Christmas comes around, you stuff yourself silly, and laze about killing the time between Boxing Day and New Year’s Eve. Then, come January, the fun begins. The sun turns up, the chill-out is on full, and you live in the same get-up everyday, while sipping on coconuts. This is the essence of vacation time; the magic of warm sun, good food, and the forgetfulness of daily life in the grind. This is the magic of Vacation. A small cafe that delivers big on holiday good times. Coffee is on point, curated and self-roasted at the exclusive Bureaux Collective. Food is superbly simple, reminding you that the simple things in life make you happiest. And the sun, oh the sun! Vacation have managed a way to capture the Earth’s light source and direct it right into their beautiful storefront on Flinders St in Melbourne. It has a way of transporting you to a warmer place instantly, even in Melbourne’s famously erratic weather. Owners are brothers Kael and Matt Sahely, plus Jimmy Tjoeng and Julian Bedford. Vacation is on the ground floor of a historic building on the corner of Flinders and Exhibition Streets delivering this holiday experience 7 days a week. And we have to say, it's damn impressive. “A lot of these smaller places in the city have low, dark ceilings, they’re all at the base of buildings, so generally the ceiling height is no more than three metres,” Julian says. “We have eight metres and it’s almost always sunny – it’s a nice feeling.” An oasis in the heart of the city. “The idea of Vacation is just a bit of fun,” says Kael, while passing over their signature cold brew grapefruit beverage. “We play with flavours, and really just want to show you that good coffee can really be an instant vacation on its own”. The guys didn’t hold back on the flavours and experience for these beans you’re tasting today either. These flavours will have you back on holidays eating fruit from trees in between fresh ocean swims. For the Guatemalan Waykan filter, we’re getting big pineapple blasts with little blueberries on top: the perfect summer dessert. 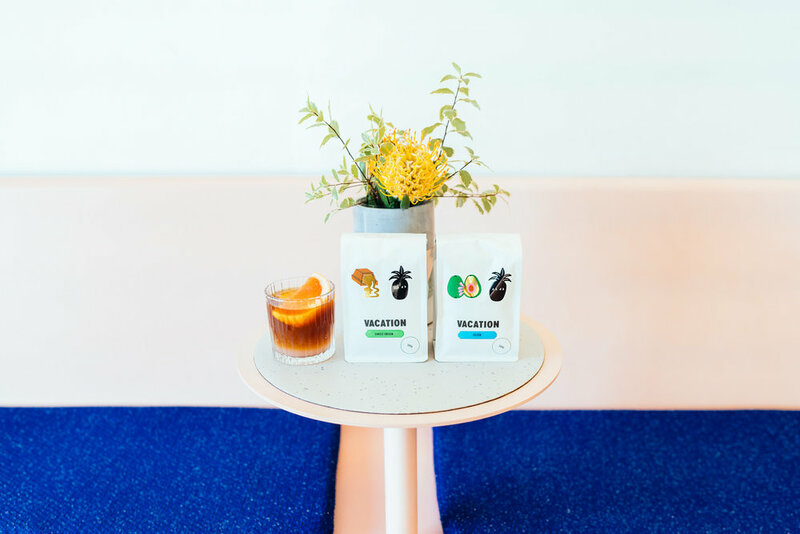 The Vacation single origin espresso also delivers on the fruits, sticky with cherries and plums that continue the fruit party from morning till night. Close your eyes, go to your happy place. By the time you’re reading this, your vacation may already be over: you’re back on the emails, checking the gram and thinking about your next long-weekend break. But it doesn’t have to be this way. Remember the spirit of vacation time: warm sun, good food, and the forgetfulness of the everyday. Or get the holiday inspo on Instagram @its.a.vacation.